I like Angry Birds Star Wars. 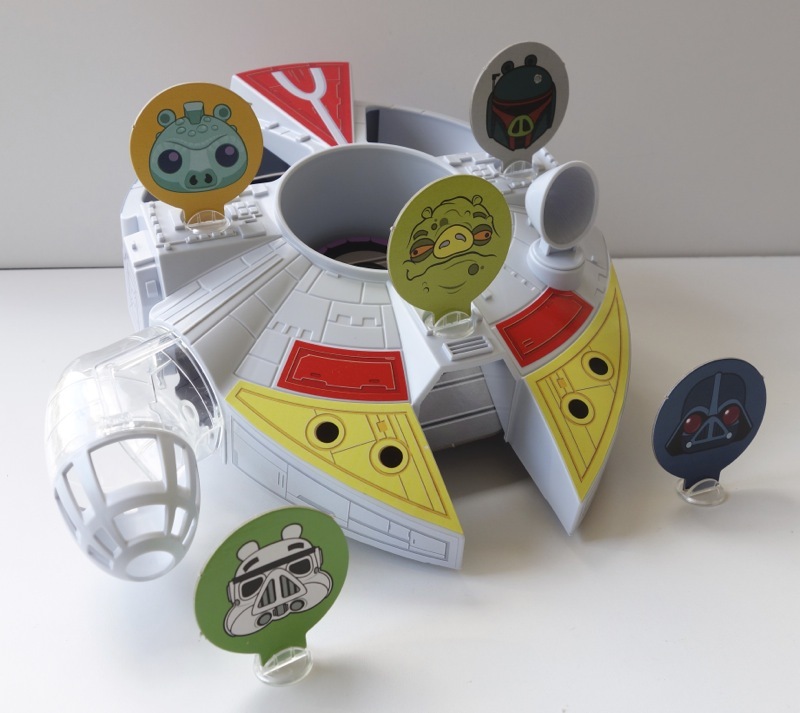 I’ve heard Star Wars collectors complaining about all the merchandise, as if it’s somehow a choice between the realistic toys that they prefer and these cartoony ones. For the most part, I don’t think that’s the case. They’re targeting different audiences. I like how the Angry Birds toys have dozens of bird and pig versions of the characters we love, all created from scratch, unlike many of the licensed products out there that just lazily reuse the same old photos that we’ve seen for years. And the apps are good as well. That said, I didn’t have very high hopes for this game. I got it partially because Walmart had it at a relatively cheap price (less than $10) and partially because one of the characters is Jabba. But it turned out to be pretty enjoyable. 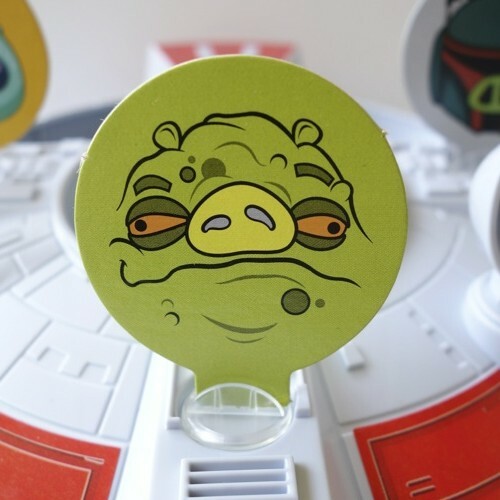 It comes with three pingpong balls with the characters of Luke, Han Solo and Chewbacca on them. 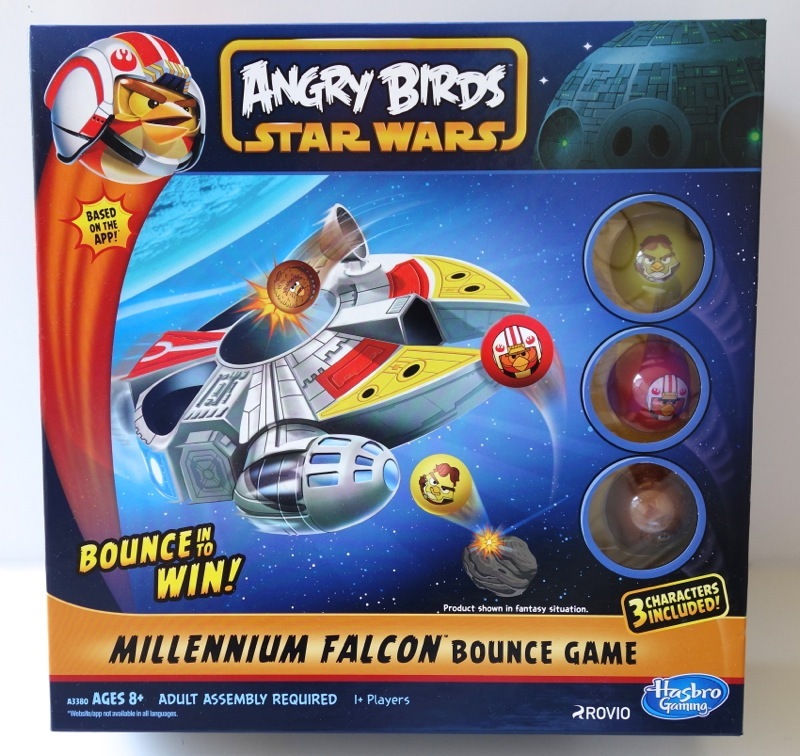 The object of the game is to bounce the balls off the surface that the falcon is on and get them to either knock over the enemy characters or get inside part of the falcon (or both). It can be a little challenging. There is a fair amount of assembly that you have to do before you can play. The falcon must be put together and have its stickers applied, and so forth. It also comes with a number of stickers that you can use to decorate the inside of the box, which are used as a backdrop for the game to help catch the bouncing balls. 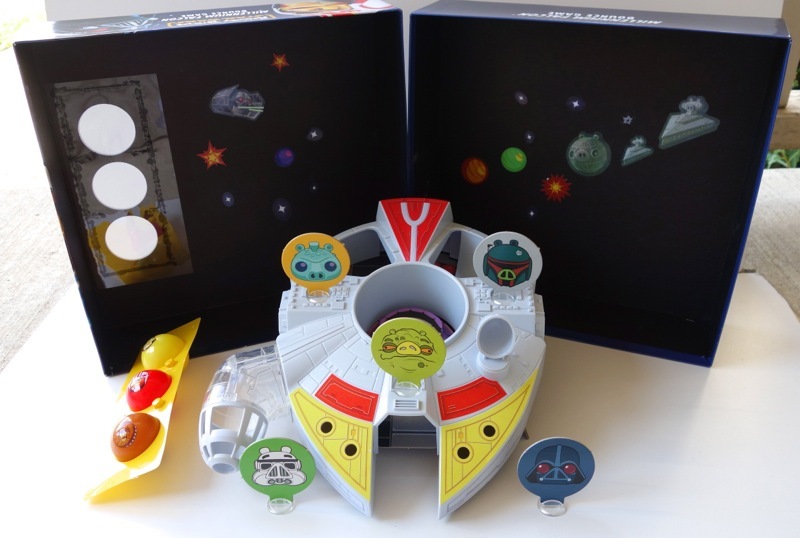 The box is nice and sturdy and can be used to store the game when not in use, but you do have to disassemble the falcon to get it back in the box completely. You get different amounts of points depending on what you manage to do, but the best is getting one to go in the center of the falcon and roll down into the cockpit. Four of us ended up playing: me, my sister, father and my 8-year-old son. Of course there’s no way we would have been playing this game if my son hadn’t been there, but I think we all ended up enjoying it (and my father proved to be surprisingly skilled at it, beating us all handily). If you play the game with at least one kid (or maybe as some sort of drinking game :)), it’s not bad at all.